Over the past week I have been visiting family, firstly my son in London where we had a really great time seeing many parts of the city and going to the theatre one afternoon. After returning home for 24 hrs we went to Stratford-upon-Avon and I stayed with my sister Jane for a few days, catching up with all the news and giving her some shuttles to put in her suitcase to sell at Tat Days and here they are. Obviously because Jane is teaching she is unable to carry many shuttles so these were especially chosen. There is going to be a list beside them for people to order shuttles they would like, as the above will probably be sold fairly quickly. So sorry unable to take individual orders at the moment from anyone, more eventually will go into Jane's shop. As I said this pre-ordering is just for the privileged who are going to be at Tat Days. Whilst we were in London I went to see Sue Hanson who has kindly given us some wood to make shuttles from. This was a very quick visit as my son was driving his little Smart Car (two-seater) through London and he got a little stressed! We also had to leave most of the wood with him as we had travelled to London by train, he is now storing it for us, but will show you a picture of what we managed to carry back. 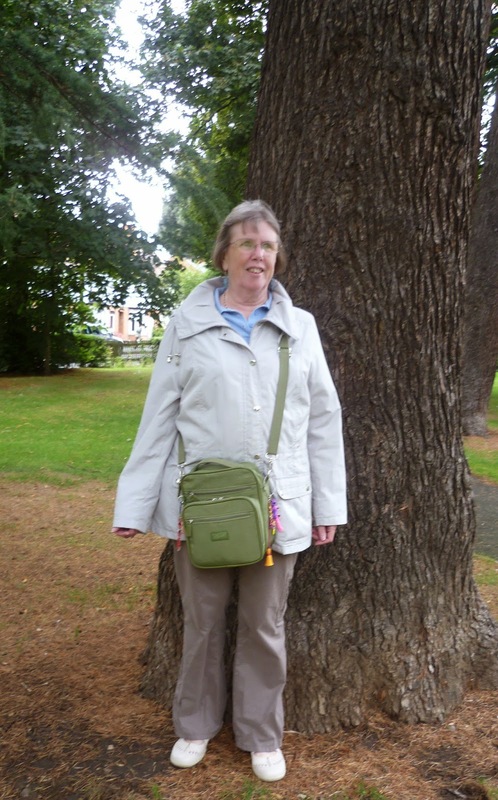 Finally a picture of Jane propping up a tree which I took today, just in case those of you who are attending Tat Days don't know what she looks like! She is almost packed and ready, I am very impressed at how organised she is. Lucky people indeed, who are going to the Tatting weekend! - I should imagine anyone driving through London would get a little stressed, but at least you managed to collect the wood. And that's a lovely picture of Jane, she looks, as they say, "Ready for the Off "
It's a shame you're not going with Jane this time! They alsoo serve who only stand and waite! Wow! Love these shuttles! Would love to have one! Hermosas lanzaderas, mi esposo tambien trabaja la madera , hace navetas.